While we were shuffling through the kitchen, I mentioned to Steve…I really need to get this fudge made so it can set in the fridge in time for tomorrow’s piano Christmas recital. People were flying in all directions, babies were toddling in and out of the kitchen, Christmas songs are being practiced on the piano and I’ve got 2o minutes. But amidst the chaos, I managed to get this fudge made and poured into the pan…in plenty of time to get to the theatre. 15 minutes, mostly in the microwave and this was done! I took the Eagle Brand Dulce Fudge recipe and added in some instant coffee, coarse sea salt, melted chocolate chips…then sprinkled a little more coarse sea salt on top. Drool…….worthy, this fudge. 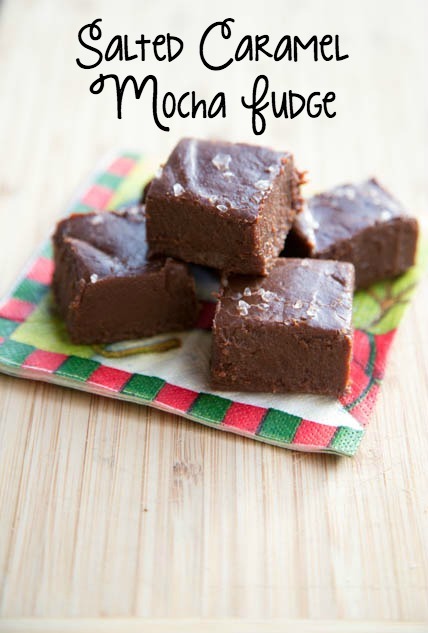 Hope y’all enjoy this favorite coffee beverage from the ‘bucks…in fudge form! Line an 8×8″ glass baking dish with parchment paper. This will help easily remove the fudge once it is set. In a glass microwavable mixing bowl, add the butter, brown sugar and Dulce de leche flavored caramel sauce. Microwave for 10 minutes, stirring every 2 minutes, scraping the sides of the bowl well. Then let cool for a few minutes. In a small glass bowl, add the chocolate chips. Cook on high in the microwave for 1 minute, then stir. Cook for another 30 seconds, then stir. Repeat in 30 second intervals until smooth. Stir the melted chocolate chips into the melted caramel. Then gently stir in the instant coffee granules and the coarse sea salt. Stir with an electric beater for 3 minutes, or whisk aggressively for 3 minutes. Then spread the mixture into the prepared baking dish. Sprinkle some coarse sea salt over the top. Chill in the refrigerator for about 2 hours, or until set. 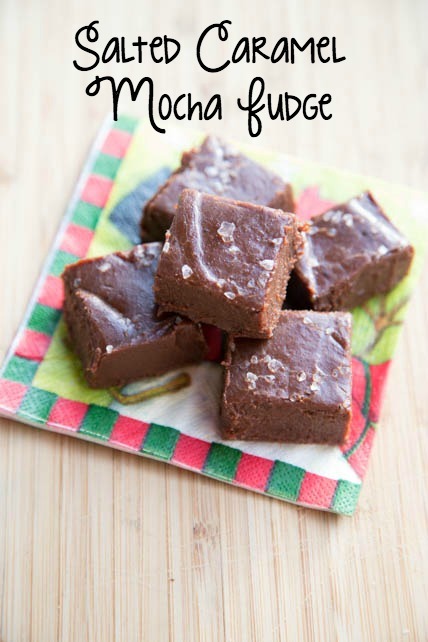 Remove the fudge from parchment paper and baking dish. Place on a cutting board and slice with a sharp knife into 1″ square pieces. Makes 48-64 pieces, depending on how large you slice the pieces. Could this sound anymore delicious? I’m a sucker for anything salted caramel. Me too Kristi. Me too! That is just mouth-watering! Caramel is underrated if you ask me, my friends always ask me why I choose it when buying icecream over the typical chocolate fudge. What brand of Dulce de Leche sauce do you use? entranced by this site. We are on a limited budget and you make them sound ( the recipes) sound so good and healthy. 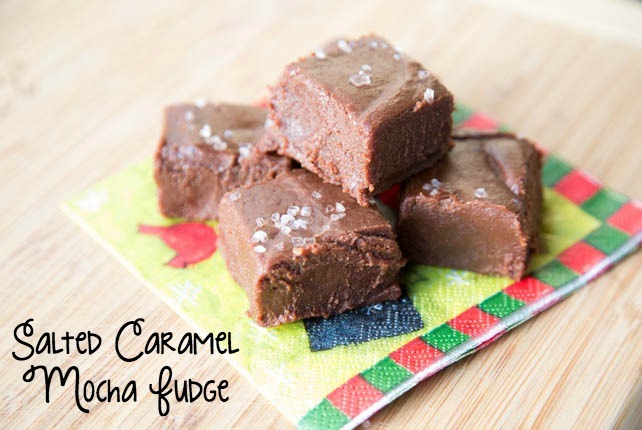 Anyone have a great recipe for Sea Salt Caramel Candy? I might have something for you … I don’t know how much the caramel sauce costs, but they have that recipe where you boil (?) the can of sweetened, condensed milk and it turns into caramel sauce? It might be a way to bring the cost down more..? I’m trying this recipe for the first time. There’s a layer of liquid on top that didn’t want to blend. I hope it’s ok!! I’m placing in the fridge now. We will see in a couple of hours.